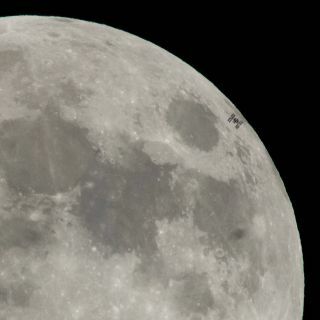 NASA photographer Bill Ingalls captured this shot of the International Space Station transiting the full moon on Tuesday (Jan. 30) from Alexandria, Virginia. A spectacular photo shows the International Space Station (ISS) crossing the face of the moon in the lead-up to Wednesday morning's (Jan. 31) long-awaited "Super Blue Blood Moon" eclipse. NASA photographer Bill Ingalls captured the shot from Alexandria, Virginia, on Tuesday (Jan. 30) — a day before the full moon plunged into Earth's shadow in the first total lunar eclipse since September 2015. NASA astronaut Bill Ingalls captured this view of the International Space Station crossing the face of the moon on Jan. 30, 2018 from Alexandria, Virginia. There's a lot more to say about Wednesday's skywatching spectacle, of course. The eclipse involved a moon that was both "blue" (it was the second full moon of January) and "super" (it was near the closest point to Earth along the moon's elliptical orbit). Such an eclipse hadn't occurred anywhere in the world since 1982, and not in the United States in more than 150 years. The ISS is currently fully staffed, with six crewmembers on board. They are NASA astronauts Joe Acaba, Mark Vande Hei and Scott Tingle; cosmonauts Alexander Misurkin and Anton Shkaplerov; and Norishige Kanai of the Japan Aerospace Exploration Agency. In case you're wondering, it looks like the space station's crew was not able to see the Super Blue Blood Moon eclipse. The eclipse occurred while the crew was busy working, and most of the station's windows point down toward the Earth, making it hard to bring the moon in view. Kanai shared that news Wednesday on Twitter after the lunar eclipse ended.